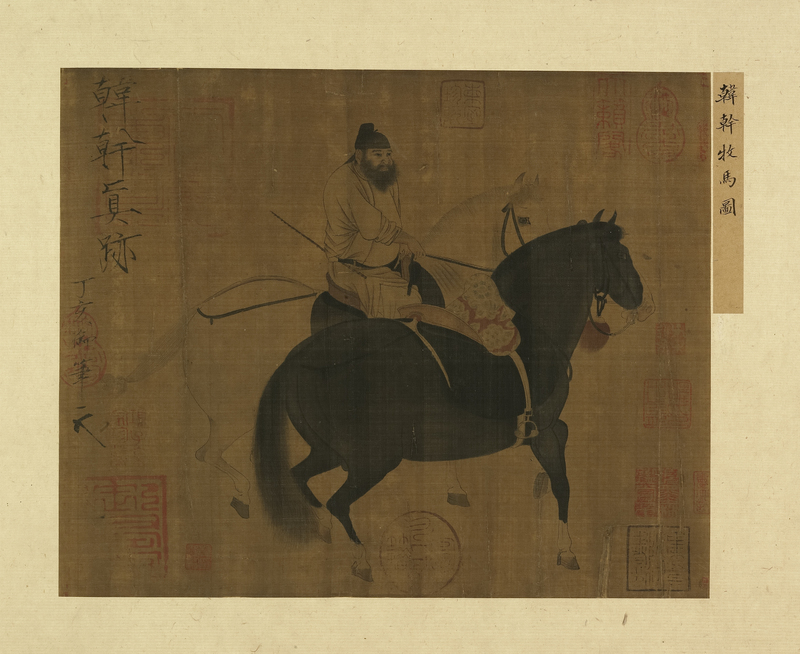 This work, the third leaf in the album "Collected Treasures of Famous Paintings," shows a groom riding on a white horse side-by-side leading a black steed. On the painting is an inscription by the Song dynasty emperor Huizong (1082-1135) that reads, "A true trace of Han Gan, (as indicated by) the imperial brush in 'dinghai,'" a cyclical year that corresponds here to 1107. Han Gan was a famous painter of horses under Emperor Xuanzong (reigned 712-756) in the Tang dynasty. The style of this painting, the appearance of the groom, and the short legs of these stocky horses all conform to renderings of similar images excavated from Tang dynasty tombs, the forms indeed bearing the vigorous and sturdy bearing of horses and figures in Tang paintings. However, the delicate forcefulness of the lines and continuity of angular strokes in places as well as the brocade decoration of the saddle here all reflect instead the style of painting in Huizong's period, which would make this an exceptional Northern Song copy of an ancient work.